The Brattleboro Historical Society history center on Main Street in Brattleboro will be closed through January 24. Re-opening on January 25. Sorry for the inconvenience. We will look forward to seeing you in January. BRATTLEBORO — The Guilford Street Ski Tow opened to the public in January 1938. It operated on the Clark Farm in the area now occupied by Living Memorial Park. For its time, the tow was one of the most modern in New England. An all-day ticket cost 35 cents and a half-day ticket was 25 cents. In 1939 lights were added and the tow operated three nights each week. The ticket price for night skiing was 25 cents. The primary people who got together in the early summer of 1937 and formed a plan to build and operate a ski tow in Brattleboro were Robert Billings, Elliot Barber, Floyd Messenger and John Dunham. In 1937, on the Charles Clark Farm, where the Living Memorial Park is now located, construction of the “Guilford Street Ski Tow” was begun. The farm had been idle for a few years so there were no farming operations interrupted by the creation of the tow. It was an 1,100-foot rope tow that had its terminal building built up on two large timbers at the bottom of the hill. It was quite modern by any standards in that it had a fairly large electric motor for power that would easily handle 300 skiers per hour. When the rope reached the top it traveled around a 3-foot bull wheel and came back to the bottom riding on Model A Ford wheels fixed to the top of light poles about 16 feet high and 60 feet apart. At the end of the day the bottom rope that traveled along the ground pulling skiers to the top of the hill was lifted up by a ski patrol member and placed on the lower wheel about five feet off the ground so that it would not freeze to the ground. The facility opened to the public the first Saturday in January 1938. At the time, it was one of three rope tows operating in New England. After World War II was declared on December 8, 1941, life changed. Members of the Vermont National Guard unit in Brattleboro left en masse, more than 200 at one time. Men were being drafted, and men and women were volunteering in considerable numbers. Of the four men who created the rope tow, only John Dunham remained behind, and with the help of Holland Douglas and several others the Ski Area continued to operate during the war. In 1948 the rope tow was removed and installed at nearby Sugar Bush ski area in Jamaica, Vermont. War Bonds sold for $18.50 and could be turned in after 10 years for $25. The Bonds were used by the U.S. government to help pay for the war. Letter writer William Evans bought the first War Bond for the Living Memorial Fund and the idea caught fire. By the end of World War II almost $34,000 worth of War Bonds had been donated to the fund by local citizens, businesses and clubs. In 1954, as the Bonds were close to maturity, it was suggested that the funds be used to buy the old Clark Farm where the rope tow had been in order to establish a Living Memorial recreation area with a swimming pool and other facilities. This would also help solve the uncomfortable problem of water contamination at the West River Bathing Beach. The 53-acre Clark Farm was for sale for $35,000 and the Clark family decided to donate the difference between their asking price and the $33,875 collected in the War Bond fund. In 1955 and 1956 Living Memorial Park came to life. The town voted to spend $115,000 to build a swimming pool. The new ski tow went in through a donation from the Rotary Club. The rope tow was upgraded in 1966 to a Doppelmayr T- Bar. The Lions Club built the road leading to the upper level of the park. A swamp behind the swimming pool was converted into a skating pond and the Kiwanis Club built the shelter at the top of the hill. The American Legion funded the construction of the softball field next to the pool and the Brattleboro Athletic Club and Dunham Brothers donated money for the Small Fry baseball diamonds. Many other clubs and individuals made donations to create the landscaping and playground adjoining the swimming pool area. In 1974 the Nelson Withington Skating Rink was constructed and in 1975 the tennis courts were created. In 1984 the Rotary Club supported the building of the outdoor theater and in 1987 another Small Fry field was built. The park continues to adjust to the needs of the community. Through the years Living Memorial Park has been a collaboration of the town and civic organizations. In 1995, because of unpredictable snow and financial considerations, the town decided to stop operating the ski tow that had been in use since 1955. In 1997 a non-profit organization, Living Memorial Park Snow Sports, took over the ski tow and has been operating the lift ever since. Living Memorial Park is a unique place. It grew out of a respect and recognition of those who served during World War II, it has become a home for small town community memories and underscores the claim that there is only one Brattleboro. There are several parts to this exhibit. You may start wherever you like. 1. Brattleboro is at the confluence (2 rivers coming together) of these two rivers? List them both by their Native names and English names. 2. The first permanent English settlement in Vermont was located in Brattleboro. What is its name? You will find artists’ drawings of the fort in this exhibit. Make your own drawing of it. If you’d like to make a special effort, do a pen & ink drawing when you have time & send it to the Brattleboro Historical Society. Each of the following sections of the exhibit has information panels & photos in flip charts. To complete everything, you will need both. 3. How large a town is Brattleboro compared to others in Windham County? 4. Can you find Brattleboro & put it on your map? 5. Make a written description of Brattleboro’s location? 6. Rivers were highways in the days of early river travel but were replaced by what in the 1840s? 7. Can you find an image of Brattleboro’s train station in this exhibit? Can you make a sketch of it or take a photo of it with your phone? 8. What was Eugene Feritier’s job? 9. Brattleboro is described as a crossroads for multiple roads. What are the road numbers? 10. Where is Brattleboro’s RR line? Is it along the river? Through the center of town? 11. Write evidence here that some people did not want the trolley in Brattleboro. 12. What did Bigelow Boats do? 13. Find the bridges that Brattleboro had(s). Make a sketch of YOUR favorite. 2. What happened to Brattleboro’s population from 1870 – 1920? 3. What did the construction of the Vernon Dam do to Brattleboro? 4. Can you find the Vernon Dam on your map? 1. What company appears to be Brattleboro’s most famous? 2. How did Brattleboro’s farmers cooperate with one another? 3. From the photos in Industry & Commerce………..
Who ran the Millinery shop? Did Brattleboro have a cotton mill? Where would you go to find Crocker’s Best Flower? If you wanted some jelly in Brattleboro, what company looks best able to supply your needs? From the photos of the Estey Organ Company, it appears that you would need something other than a truck to deliver the organs. What is moving the organs in the photos? 1. What world famous composer had an Estey Organ? 2. Brattleboro is the home for registered Holstein cows for where? 3. What Brattleboro company became the largest independent foot ware wholesaler in the United States? 1. Of what notoriety (makes it so well known) is Brattleboro’s Brooks House? 2. What proof is there that Brattleboro had a vibrant religious presence? 3. Technology changed Brattleboro at the end of the 19th Century. What evidence is there of this? 4. How do the photographs of Brattleboro’s Main Street compare with your Main Street? 5. Livery service is mentioned. Do you know what that is? Can you find out? 6. The photographs show that the Brooks House was used for many things over many years. What uses can you find? 7. If Brattleboro were deciding to modernize, would you lobby the town to keep the Brooks House or tear it down. Write your argument to support your position. 6. What U.S. President came to Brattleboro in 1902? 7. There’s a famous clock on Brattleboro’s Main Street today. Who put it there & when? 8. How many bricks were used to rebuild the Crosby Block after the 1869 fire? A. If you piled them up, one on top of the other, how high would they go? B. If you piled them up end to end, one on top of the other, how high would they go? 9. The display says that ‘Jubilee’ Jim Fisk was ‘laid out’ for public viewing. A. What does that mean? B. When you get back to school/home, see what you can find out about Jubilee Jim. We think you will find him quite interesting! 1. When did moving pictures come to Brattleboro? How does this compare with your town? 2. List the visiting entertainers & local artists mentioned in the display. 3. Now, join with others to divide up the list to see what you can report back to your group after you have had time when you leave the exhibit. 4. There looks to be a larger & patriotic gathering on Brattleboro’s Main Street in one of the photos. What was going on to attract so many people? 5. Pick one of the photos from the chart titled ‘ARTS & CULTURE’ that features ‘Visual Artists’, ‘Writers and readers’, ‘Outdoor recreation, and Amusement park and fairs’. A. Pick 2 types of entertainment from this panel that you wish were still here. B. What would you say if you met Rudyard Kipling, Mary Wilkins, Jim Fisk? C. Have you ever seen live ski jumping? D. What would you expect to see and do at Island Park? E. What do you see happening at the Valley Fair in the photo? F. Where was the Masquerade Ball held? G. Did you see the theater in the Town Hall? Describe it. H. Put a check mark next to each of these that played at the Auditorium in Brattleboro. 7. The item about John Phillips Sousa says he played at the Auditorium in Brattleboro. Can you find a photo of the Auditorium and sketch it now? 8. Does a horse & buggy ride up Mt. Wantastiquet sound like fun? Where is Mt. Wantastiquet in relation to Brattleboro? 9. Helen Modjeska and Mark Twain were both in Brattleboro. Were they there at the same time? Can you find out who they are? 1. This is a list of organizations in Brattleboro between 1870 & 1920. Take a moment to go through the list and compare it with your town today. How many of the clubs and organizations are in your town? Which ones would you be interested in joining? The compass rose is located on the right side of the map. Looking at the compass rose, in what direction is the Connecticut River from Brattleboro’s Main Street? Using the Scale of Feet, how many feet long is Crosby’s Block on Main Street? What is the name of the Brook that flows into the Connecticut River? The Brattleboro Jelly Mill was located on which street? The Baptist Church is located in the north, south, east or west portion of the map? What heat and power source did the EP Carpenter Company use to run its building? What year is represented on this map? What were the names of the two railroads that ran along the east side of Brattleboro? Propose a reason why there are four reservoirs located near the downtown area. What was their purpose? After looking at the map, how is your town similar and/or different from Brattleboro? Give three examples. This is a scale model of Brattleboro’s train station – today, the Brattleboro Museum and Art Center. The station is located near downtown and Main Street, next to the Connecticut River. It was important for transportation of passengers and freight. This model is built by Doug Cox, who is also a violin maker in Brattleboro. The Estey Organ company was the world’s largest manufacturer of reed organs, and the only company to produce reed, pipe, and electronic organs at the same factory. Sit on the bench facing the keyboard. Put your feet on the pedals and pump them gently. This will fill the bellows with air. Pressing keys on the keyboard sends air from the bellows through metal reeds, causing them to vibrate and make sound. Keep pumping, like you are slowly riding a bike, to keep the bellows full enough to make sound. If you stop pumping and keep playing, what happens? The organ knobs are called stops, and allow the performer (that’s you!) to get a variety of sounds from one organ. An 1896 Sanborn Fire Map, showing downtown Brattleboro. Fire maps are fun to look at because they are very descriptive. Every building is identified and the map conveys a tremendous amount of information. You will find some activities to go with the floor map in another section of this guide. This is a collection of various bottles used by Brattleboro dairies. The book of milk tickets was a way to keep track of payments when milk was delivered – directly to your door. A collection of tools used by workers at the Estey Organ Company in the production of pipe organs. The company produced over 3,000 pipe organs. One of the major industries in Brattleboro was printing and publishing. Brattleboro also attracted authors. Take a close look at The Jungle Book. It is signed by Rudyard Kipling, who lived on the edge of Brattleboro. The other book is a story by Charles Dickens, sort of. He never finished it, but Brattleboro printer Thomas Powell James said he channeled Dickens’ spirit to ghostwrite an ending. These chairs from the original Brooks Library on Main Street. S.A. Smith was a maker of carriages and toys in Brattleboro. On display is one of these toys and a catalog in which it is advertised. Take a postcard! Brattleboro Historical Society’s gift to you. I. Preliminary Requirements (for use for educator’s wishing to make a day at the exhibit an interdisciplinary experience). Educators – this is an ambitious undertaking. You may want to split your students into groups to collectively accomplish all that is here. B. Outline two different routes to get to Montpelier, VT, listing the route numbers that you choose. C. Estimate, showing your calculations, the time of arrival in Montpelier. Departure time is 0:00 AM. D. Justifying your choice, indicate which is the best route for us to take. E. Estimate the time of arrival. G. Bring paper and writing utensils with you on the day of the field study. H. Bring a calculator if you have one. It will save you time and effort. II. Student booklet distributed at the time of departure. 1. This is your map work for the trip to Montpelier. You will be marking a number of places on your map as the bus moves toward Montpelier. Pay attention to the road signs. You will also need to record mileage between places, so remain alert. 2. As we move, you need to trace on the map you have been given the route we are taking. 3. We will be doing some D=RT problems, also. Put the route numbers at the numbered intersections in the space provided and then place the number on your map in the corresponding location. Become a Member of The BHS! We have discovered a meteoric rise in the number of people following the Brattleboro Historical Society’s social media sites. Currently, thousands of people are daily likely to view our postings of Brattleboro history. Would you consider becoming a member of the Brattleboro Historical Society? Yearly membership is $25.00. Membership benefits include receiving our newsletter. We are strictly a non profit and 100% of your membership dues will go to the efforts of the BHS. Here is a link to the most recent newsletter to give you a sampling. Thank you. About the car – It is a Ford Model N Runabout made in 1906. It belonged to Brattleboro’s John Ryder. Fred Adams, using a Kodak camera, placed his 1 year old son, Lyman, and Lyman’s friend, 2 year old Howard Rice, and took this photograph in October. The car had a 15 horse power, 4 cylinder engine and reached about 45 MPH. This Model N was the best selling car in America in 1906. Ford’s Model T came out in 1908. The photograph was taken on Brattleboro’s North Street. Howard Rice graduated from Dartmouth College in 1926 & retired as an Associate Professor from Princeton University in 1970. Lyman Adams earned a degree in Mechanical Engineering at Worcester Polytechnic Institute (WPI) in 1928. He retired in 1967 from the American Optical where he had been Personnel Director. 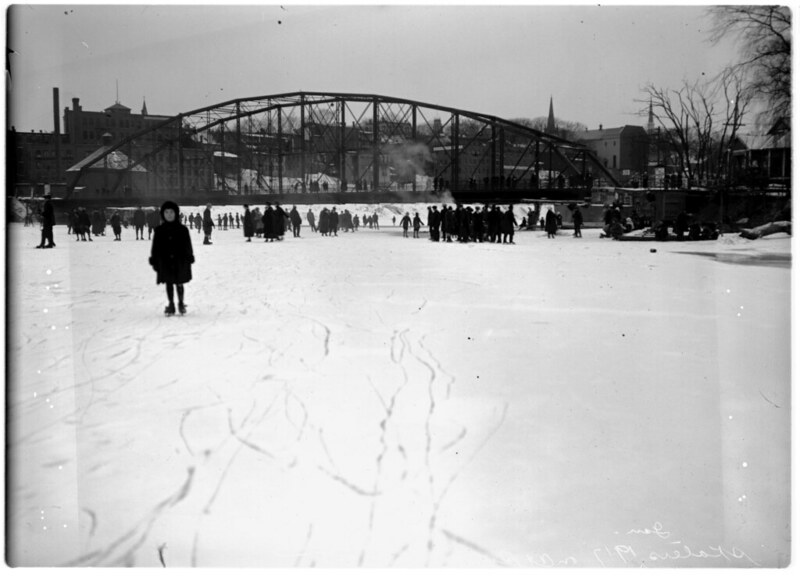 Winter in Brattleboro: It was Cold and Snowy Back in the Day, too! Gordon Haywood is speaking at the History Center, Friday evening 12/2, to discuss his new book about the Latches family and building. At the BHS History Center on Main St.